Filter station with both sand media filters and screen filters Photo: L. Schwankl. 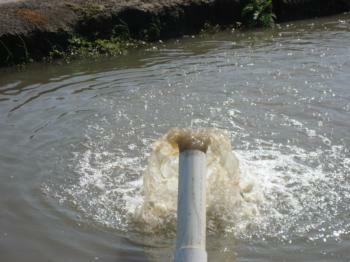 Filters are most frequently located at the head of the microirrigation system, but they may also be located in the field (secondary filters, often screen filters). There may even be small, screen washers in the fittings at the head of lateral lines. A surprising amount of contamination may collect on the secondary filters and screen washers and because they are located out in the field, their inspection may be less regular. Due to the large number of these filters and their tendency to clog up quickly, many growers decide not to use screen washers in the lateral line fittings; instead they depend on good primary and secondary filters to take care of contaminants. These filters require much less labor to clean. Automatic backwash controls for sand media filters. Filters backwash on a user-set schedule with a pressure drop override Photo: L. Schwankl. Filters – whether screen or media – should be backwashed periodically to clear out any collected particulate or organic matter. 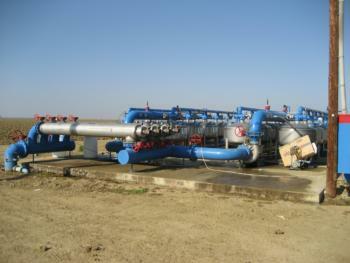 Clogged filters can reduce pressure to the system, lowering the water application rate. Backwashing can be done either manually or automatically. 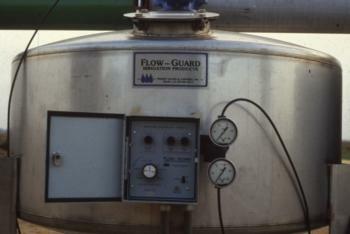 Depending on the design of the screen filter, manual backwashing is accomplished either by physically removing and cleaning the screen or by opening a valve to allow the system's water pressure to scrub the screen clean. To manually backwash a media filter you need to inititiate a backwash cycle in which the filter circulates water from bottom to top, causing the media to be suspended and agitated, which washes the particulate matter out of the filter media. Backwash water from a sand media filter Photo: L. Schwankl. Automatic backwashing of screen or media filters accomplishes the same task on an settable, automatic, time basis. For example, the filters may be set to automatically backwash every 8 hours. Most automatic backwash systems have an overriding pressure-sensing system that will initiate backwashing if a preset pressure differential across the filter is exceeded. Check with the filter manufacturer or dealer for recommendations on the allowable pressure differential for your filters. Checking the sand in media filters is a frequently neglected maintenance task. You need to inspect the sand in sand media filters periodically to see that the sand is not caking and cracking and that it is being adequately cleaned during the automatic backwash cycles. In addition, the unit will lose some sand during the backwash cycles, so even if the filter is in good shape, it may require additional sand from time to time. During inspection you should also feel the sand. The sand grains should be sharp edged, not rounded smooth like beach sand. The sharp edges promote better filtration but backwash cycles will wear the sand smooth over time. If this has occurred, replace the sand. The rounding of sand edges may take a number of years, but it will eventually happen.